The muffins of my childhood (at least in my memory) are blueberry, with a generous topping of cinnamon sugar. 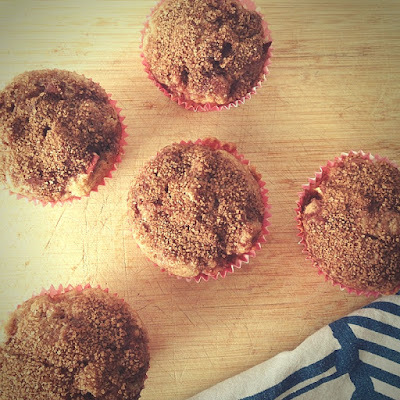 Whilst I still have a soft spot for blueberry muffins, apples are considerably more cost effective, which makes them a great option for a quick baked treat - and they sing when combined with cinnamon. Even better if you have a direct-from-tree source for the fruit - we don't yet but hopefully we will get to that point in a few years. Muffins haven't been very much on my radar baking-wise, though - pre-kids I preferred fiddlier, more sophisticated baking - or at least a higher ratio of butter and sugar. These days I'm lucky if I have 10 minutes to throw the batter together (although you can easily double whatever time it takes if I have "help") and I know little fingers will be doing their best to get their hands on the finished product. This all means a slightly easier and healthier (marginally - everything's relative!) treat is appealing - especially to a heavily pregnant lady who feels like she should be filling the freezer with quick carby snacks but who would really rather be resting. It's taken me quite a few batches to be happy with this recipe - it seems so simple but it just wasn't quite right. I like a good strong dose of cinnamon to amp up the flavour, and wanted the process to be as easy as possible. 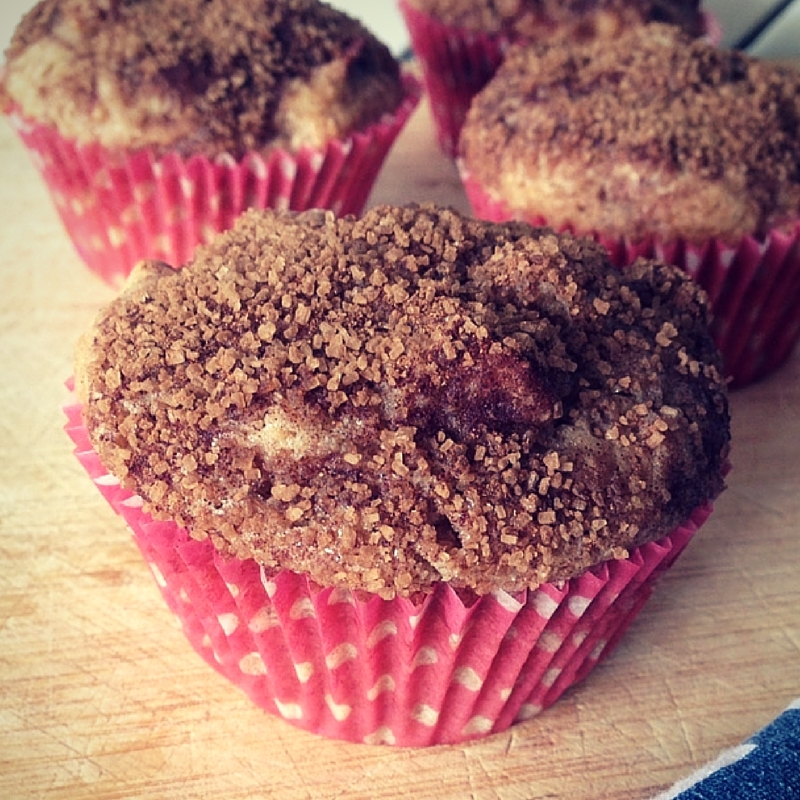 Getting the right crunchy sugar topping without burning the tops of the muffins also took some refinement (but I'm sure you'll appreciate it was a worthy plight). The amount of apple you use has some flexibility, so don't panic if you have a bit more or less than the recipe calls for - one of my batches used about three cups, which did mean the muffins were a bit less structurally sound (not enough batter to hold all the apple together) but they still baked well and tasted good. And if you, as I do, have a small baking assistant who likes to quality check ingredients during the preparatory stages, and as a result end up with a bit less than planned to go in the batter, that'll work out just fine too. You can leave the cinnamon sugar off the top, but I personally consider it essential so if you omit it you are doing so at your own peril! It's definitely worth getting some good crunchy sugar for this part - though normal white sugar will be better than nothing, a nice raw sugar with a coarse grain (demerara is my pick) will really up the ante. Preheat oven to 160 C on fan bake. Line a muffin tin with cupcake papers. Combine the dry ingredients in a large bowl. Dice apples, toss with the extra measure of flour and cinnamon, and mix through dry ingredients. Add wet ingredients and fold to combine. Spoon into cupcake papers, then mix together topping ingredients and sprinkle over batter. Bake for 20-30 minutes, or until firm when gently pressed. Serve warm with butter.